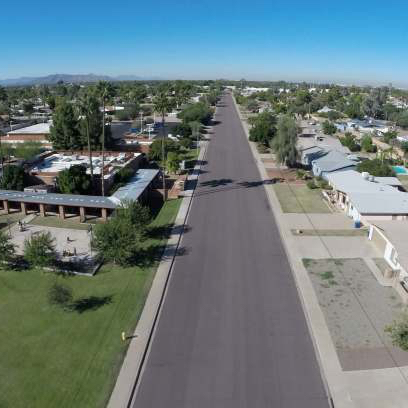 Cities in the Phoenix Metropolitan area are experimenting with building methods to slow storm runoff and allow more of it to be absorbed into the ground instead of rushing into streets and down storm drains. Low Impact Development (LID) is an approach to land development - or redevelopment - that mimics the natural environment by encouraging rainwater to stay in place and to sink into landscaping and planters, soak through sidewalks and parking lots made of permeable pavement, pour off roofs into cisterns and rain barrels, even collect on rooftop gardens. LID practices aim to preserve, restore and create green spaces using soils, vegetation, and rainwater harvesting. The City of Tempe has just taken a big step forward in determining how to make LID work for desert cities. Cities are taking a hard look at Low Impact Development methods for building streets, commercial developments and planned residential communities. The methods could reduce water used to irrigate landscaping, prevent street flooding, and allow cities to downsize expensive storm drain systems. For example, the City of Phoenix maintains an 895-mile underground storm drain system. During the Valley’s infrequent but often hard and fast rainstorms, runoff rushes into 18,641 catch basins cut out of Phoenix sidewalks and along streets or into grated dry wells often located in parking lots. Many of the storm drains eventually empty into the Salt Riverbed. Last year, the cities of Mesa and Glendale, working with the consulting firm Logan Simpson, created the Low impact Development Toolkit, which offers technical variations of techniques that make the most out of storm runoff. Mesa and Glendale have used Low Impact Development techniques on several public projects and plan more. For example, Mesa used curb cuts that allow runoff to collect in shallow basins and irrigate street landscaping around Fiesta Mall, along Southern Avenue at Alma School Road. Glendale used permeable pavement in a 6-acre park-and-ride lot at 99th and Glendale avenues where water sinks through the pavement and into the ground. Here’s the interesting part: Tempe and its consultant modeled a small portion of a neighborhood with a history of flooding problems by dividing it into even smaller 4-square-feet grids. The city then overlaid the model with different Low Impact Development techniques. This model produced the state’s most detailed and quantifiable data about the effect of Low Impact Development techniques on storm runoff. The small section of the neighborhood was modeled using different Low Impact Development methods, such as driveways made of permeable pavement and yards contoured to hold water and release excess water into permeable underground pipes. The model included street landscaping created with curb cuts and swales to hold stormwater and even a roof garden on a nearby school building. Runoff was measured using different combinations of Low Impact Development techniques and different percentages of homeowners using the techniques. Here’s what the City of Tempe found out: If 50-75 percent of homeowners agreed to participate and applied the suggested Low Impact Development techniques to their property, flooding would be mitigated enough to downsize a proposed new storm drain system for the area. The city has concluded that retrofitting established neighborhoods with Low Impact Development techniques is possible and worthwhile. Making it work, however, would require a partnership between homeowners and the city and that needs more research. What is the best approach to engage and assist residents to apply Low Impact Development techniques to their yards? What tools and information will they need? Would rebates be an effective means to encourage homeowners to invest in revamping their landscapes and driveways, similar to turf removal incentives? For now, these Low Impact Development techniques would be most practical when used on public property, such as parks, streets and sidewalks, and when they are built into large new residential or commercial developments or redevelopments. Quantifying the effect of Low Impact Development is a big step toward helping it to gain traction in desert cities. Cities will be able to demonstrate the value of integrating these techniques into the community to better manage stormwater, reduce infrastructure costs, potentially offset landscape irrigation, and to enhance our built environment.